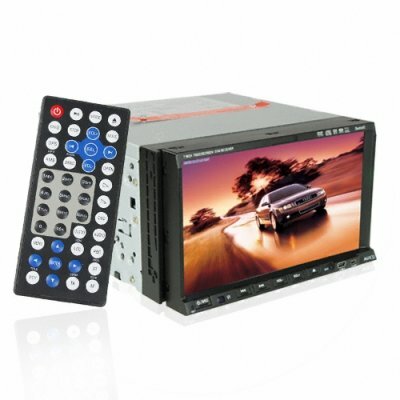 Successfully Added 2-DIN Car DVD Player - Touchscreen LCD + IPOD and DVB-T to your Shopping Cart. Double DIN sized car DVD player with 7 inch touchscreen display for playing all your digital media files with ease and featuring Bluetooth connectivity with your mobile phone for safety while driving. With such features as a 7 inch touch screen with motorized adjustable screen, excellent compatibility with many digital formats and disks, a built in DVB-T tuner, and touchscreen iPod control, this premium edition car stereo DVD player is a handy addition to any vehicle. You may have thought only celebrities could afford such vehicle amenities, but with this model multimedia system you can live the good life as well! A great wholesale price makes this car stereo DVD player perfect either for the resale market, OEM market, or personal use. As always, it is only available from your source for wholesale direct from China electronic products, Chinavasion. Includes DVB-T. Allows your passengers to watch digital TV while you are driving everyone home. love it and it come with DVB-T tuner made in it.